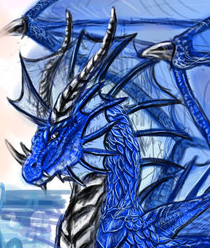 She had returned home to find several IceWings standing around one dragon, who, at the time, Trinyah hadn't been able to recognize. She noted with caution that both Chloe and Frostflare were nowhere in sight, so she wondered what the whole announcement thing was about, and, being herself, had cheerfully approached the scene. What she had seen had surprised her even more. It was the dragon goddess of magic herself, Phantom. The dragon goddess was speaking to Frostbite and Solstice about things. When the dragoness had spotted Trinyah approaching, though her excitement had changed now to curiousity, the goddess had smiled and had raised her head, and had announced, "Hello, dragons of the IceWing tribe! I am dragon goddess Phantom, and I have come to announce the naming of a new leader!" dragons had muttered in disbelief. A new leader?! Some dragons muttered sighs of relief, and others had growled with disdain. Then Phantom continued, "Trinyah, step forward." Trinyah had been so surprised and excited she had almost nearly leapt out of her skin, but she managed to remain docile, though it was obvious she was excited by the way her body shook. As she approached Phantom, many would be reminded of the way a trainee steps toward their leader when they are about to be chosen as a tracker or guardian. Once directly in front of the goddess, Phantom announced to the IceWings, and other dragons, who had appeared, "We have here a very special young dragoness. She was voted by several of her tribe mates, including Solstice, Chloe, and Frostbite, that she would make a good queen. She has shown that she can withstand even the most fearsome winds in the Blizzard's Path. She is agile and healthy. She is attuned with the healing magics. And we are all aware of Frostflare's inactivity, so there is no one for her to challenge to battle. Now, since I am already here, I, Phantom, dragon goddess of magic, here hereby declare Trinyah, daughter of Moala and Arcticus, queen of the IceWings!" And here is where the flashback ends, leaving an utterly shocked and speechless Trinyah to be congratulated by her fellow tribe mates and the tribe members from the other tribes. This was just way too much to take in! She barely even knew anything about running a tribe, and now she was suppose to lead one? It was just all too confusing for her to take in at once, and she sat down in the snow, her mouth still open from the awe and surprise of that moment. SnowFall was following Sleenia and they finally found Trinyah. She was at her old bedroom still and she saw Atlantis, the SeaWing lieutenant, with her. Atlas was comforting her and when Snow took a look at Sleenia she thought she was a bit heartbroken. "Could it be that she likes him?" She shook her head. "Never mind that now.." she thought. The two newcomers sat down and listened to the queen. SnowFall thought it was a sad story and it must have really broke her heart when the angry fire dragon came. Sleenia was really a good dragon, helping Queen Trinyah talk it all out. It seemed to Snow, that Trin seemed soothed with everybody with her. She decided to say something, And like what Sleenia said, Volcanis didn't come here to cause harm to everyone. He was protecting his sister, his family. You could tell that Volcanis did not like the snow, so why would his sister? Anyways, I think I heard him saying that he wanted to give you a praise.. Anyways, Trinyah, you'll make a great queen!" SnowFall looked at Trinyah, hoping she would calm down after the short incident. Atlantis noticed also other two IceWings entering the room, Sleenia and Snowfall. The seadragon carefully listened Trinyah's story, and also Sleenia's one. They were both two sad stories and Atlas felt very bad to hear them. "I'm sorry for what happened to you..." He sighed, refering to Trinyah and Sleenia. He looked at the IceWing's Queen. "Also, evil or bad dragons can be found in all the tribes, not only FireWings. They're usually dragon rogues that cause troubles." He told her in addition to Sleenia's words. "Anyway, I'm sure you'll be able to overcome your fears. We're all with you." He concluded with a sweet growl. Trinyah, although shaken, was inspired by the speech that the newly appointed LightWing queen and semi-goddess and given her. It was very inspiring to hear something of such power coming from the mouth of a dragoness who was young, though not quite as inexperienced and young as the frightened and newly appointed IceWing queen. Her body had stopped shaking entirely at this point, and now seemed to have retained some composure from her previous outburst of fear when she had fled from the Grand Hall because of the FireWings. But now that the creatures that had caused her to flee had left, and the palace once again felt as cold and cool as ever, and thanks to the atmosphere set upon the castle by the moral support given to her by her friends, Trinyah felt much more confident now then she had before. She lifted her head and stared deeply into Atlantis's blue eyes, then she smiled and stood up, her movement slow, suggesting she wasn't completely over it, but otherwise unshaken. "You guys are right..." she said, smiling at them. She might not have known them for a while, but she considered Sleenia and Atlantis great friends, though this wasn't much a compliment in itself since it didn't take much to befriend the IceWing queen, it was still nice, though risky if your so called best friend betrayed you, which could very well happen in her case. She then continued, heading toward the entrance of the dorm, "I think I should go and call this off.... at least, maybe, right? I still need a lot of help with this leadership business..." she added with a smile at her friends as they decided to leave the room and head for the royal hall.